Here are some fixes that actually work in case your Samsung Galaxy Phone or any other Android Phone is coming up with “No SIM Card Installed”, “No Service” or “Emergency Calls Only” Error messages, whenever you try to make a call on your Android Phone. The NO SIM error could be due to a variety of reasons ranging from minor software glitches to a faulty SIM Card in the worst case. Going by user experiences, as reported on various Android Forums, the No SIM Card Installed Error was not resolved even after replacing the SIM card with a brand new one. Hence, it is recommended that you try these simple solutions as listed in this article, before thinking about getting the SIM Card on your Android phone replaced by a new one. The simple process of turning off your Android Phone and switching it back again can solve minor glitches that could be causing the problem on your Android Phone. 2. Tap on Restart (See image below). 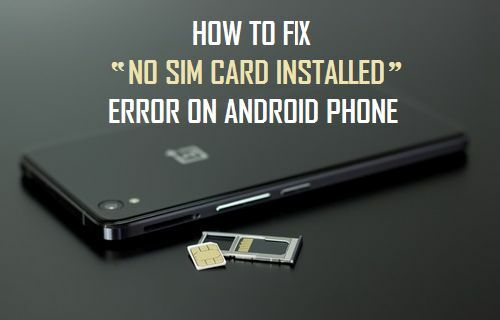 See if the problem on your Android Phone is gone, move to other solutions in case you still see the “No SIM Card Installed” Error. 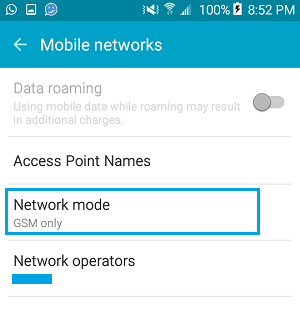 This is usually the problem with most users, the Network Type Setting gets switched to incorrect type leading to the No SIM Card error message. 2. Tap on Mobile Networks under section Connections. 3. Next, tap on Network Mode. 4. 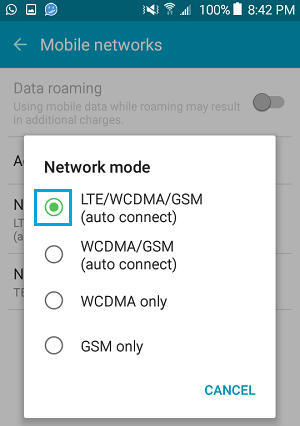 Make sure the top (auto connect) option for LTE/WCDMA/GSM Network Modes is selected. 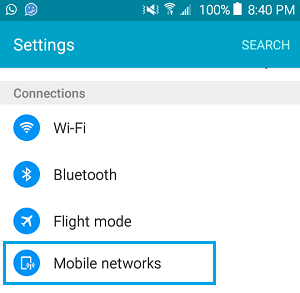 Setting the Network Mode to Auto Connect for any of the 3 major Networks should fix the problem on your Android Phone. 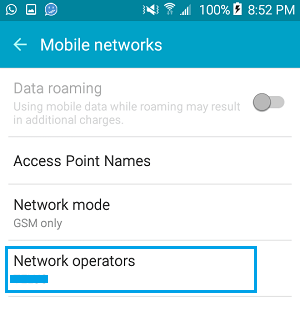 You will get “No SIM” Error in case the Network Operator on your Android Phone is incorrectly set up and does not match the Carrier that you are currently with. 2. 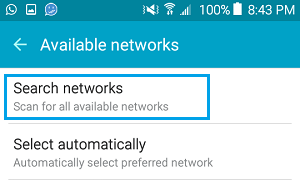 Tap on Mobile Networks tab, located under section Connections (See image below). 5. 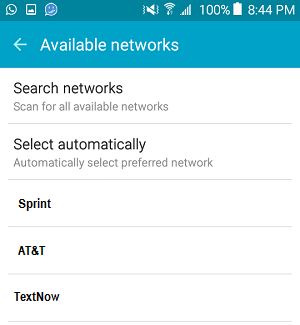 Wait for your Android Phone to search networks, once the search is complete, you will see different Carriers listed on the screen. From the list, tap on the name of the Carrier that you are currently with. 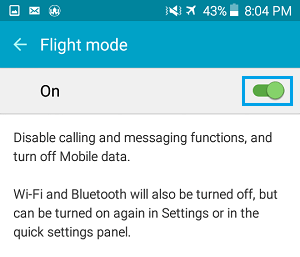 Another solution for fixing the “No SIM Card Installed” Error on your Android Phone is to Turn ON the Flight Mode and turn it OFF again. 1. Tap on Settings > Tap on Flight Mode. 2. On the next screen, toggle ON Flight Mode by moving the slider to ON position (Green). 3. 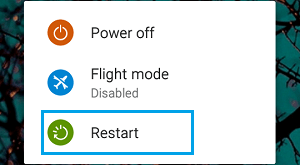 After Switching ON Flight Mode, turn OFF your Android Phone. 4. After 10-20 seconds, Switch ON your phone and toggle OFF Flight Mode by moving the slider to OFF position (White). A reboot or a Hard Reset can fix software conflicts on your device that could be causing the No SIM Error message on your Android Phone. 1. Make sure the battery of your Android Phone is charged to at-least 15% to 20%. 2. Press and hold the Volume Down and Power button at the same time, until you see the screen of your Android Phone going black. Note: You will first see a Menu coming up on the screen, keep holding both Volume Down and Power buttons, till the screen goes black. 3. Your Android Phone will perform a simulated battery disconnect. First the screen goes black and your device will then restart with the manufacturers Logo. 1. Remove the SIM Card from your Android Phone and make sure there is no dust in the SIM Tray and put back the SIM Card after making sure that it is free of dust particles (if any). You can use a flashlight to take a look inside the SIM tray opening and blow out the dust (if any). 2. In case you have an Unlocked Android Phone, try replacing the SIM Card on your phone with a SIM Card from another Phone and see if it works. Alternatively, you can try using your SIM Card on another Android Phone and see if it works. Note: The information on a SIM card can be easily damaged by scratching or bending. 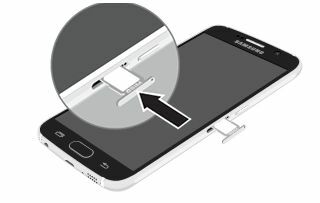 Hence, you need to be careful while handling, inserting, or removing the SIM card.